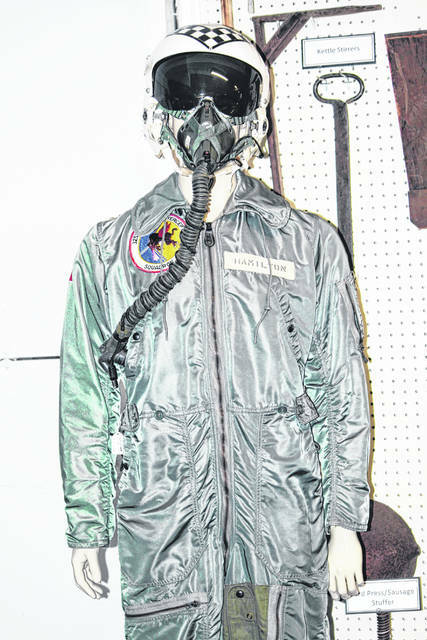 Ths flight suit was worn by Greenfield resident Edward Hamilton while stationed at Truax Field, Madison, Wisc. from 1964-66. Hamilton was assigned to the 325th Fighter Interceptor Squadron (FIS), whose purpose was to intercept and destroy enemy aircraft that might attack the United States from the north. This is just one of the many military uniforms that the Greenfield Historical Society has been entrusted to preserve for future generations. The Greenfield Historical Society will hold its second Sunday Dinner of 2019 on Sunday, Feb. 3. The meal will be held at the Grain & Hay building and will consist of baked chicken, broccoli salad, roasted potatoes, choice of vegetable, apple crisp, bread and drinks. Waiters and waitresses will be serving guests from 11:30 a.m. to 1 p.m. on real plates, silverware and linen. The cost is $10 per person, no tipping. This is the second of three Sunday dinners the society holds during the winter. The last one will be ham loaf dinner on March 3. Proceeds from the Sunday dinners go towards utility bills, maintenance of the various buildings of the society, programming and preservation of the society’s many artifacts. “Come on down after church and have a great meal, visit with friends and support the Greenfield Historical Society,” the society said in a news release. Submitted by Harold Schmidt, Greenfield Historical Society.